If you notice use of steroid symptoms in someone, learn more and see how you can help. When hearing the word “steroid’ many people think immediately of the stereotyped very strong man with large muscles, but what are steroids really? 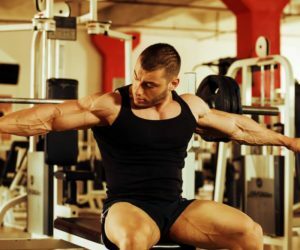 Below, we will address some anabolic steroid symptoms, facts, and history. The proper name for steroids is anabolic steroids, which were developed in the 1930s, according to the National Institute on Drug Abuse, to help combat hypogonadism. Hypogonadism is an illness that affects the testes and it does not allow them to produce enough testosterone for normal functions such as growth, development, and sexual functioning. At this time in history, it was discovered that some common anabolic steroids facts were related to growth of skeletal muscle. Since that time, steroid abuse has become so common that many times it affects and changes the outcomes of sporting events, which is highly unethical. Why is steroid abuse so common? After mentioning the stereotype listed above, there is some truth related to steroid abuse and the strength, or appearance of strength in a person, or more specifically, an athlete. It is very common for people to abuse steroids to improve their athletic performance. It is known that there are testing procedures to deter Olympic athletes from taking part in steroid abuse which end in brutal consequences for the athletes. Although there are constantly new drugs on the market that allow athletes to escape detection, facilitating a “cheating of the system.” These anabolic steroid facts related to cheating a detection system will change as more new drugs are detected. According to the National Institute on Drug Abuse and a series of interviews that were conduced with male weightlifters, 25% of those who were struggling with steroid abuse had been sexually abused as a child. These same anabolic steroid facts are to be true for women. In the case of women weightlifters, those who were struggling with steroid abuse were twice as likely to have reported being raped, then not. One of the defining reasons for steroid abuse among the people reported to have been sexually abused was to build themselves up to be strong so that in the future they can discourage attacks. Many of the steroid symptoms listed above can be reversed if the steroid abuser stops using the drugs, but not everything is reversible. If you or someone you love is addicted to steroids, the most dangerous steroid symptom is experienced in moments of withdrawal, and it is depression. Depression in not something to be taken lightly and the steroid abuse can lead to the abuser experiencing depression for up to a year after stopping the use of the steroid. If you notice that you, or someone you love many have a problem, it is time to seek help. Do not let the health or happiness of yourself, or this person become darkened by the use of steroids.